After my mammoth Glossier essay, I disappeared from the blog, gave it a bit of a makeover and skipped over the yearly beauty favourites. So, here is some of the skincare I've been loving over the last five months. Luckily, I photographed most of them before they finished. So much skincare, so little time. These are dreamy serums/skin boosters that have genuinely helped my skin. The formulations differ slightly depending on which "flavours" you pick but they're all light and quench that skin thirst as expected from a Korean beauty favourite. Purple - VE Effector* - a rose water + water base with Vitamin E derivatives. This is my morning pick to hydrate, brighten and prep my skin for makeup by creating a smooth base. Vitamin E works as a defense layer against the harsh city air. Blue - GF Effector* - a base of Ginkgo Biloba Leaf Water, this contains Grifola Frondosa a type of mushroom that tends to grow at the base of oak trees. A good pick for a big hydration boost. (Side note: mushrooms are an ingredient to watch in skincare as they have become quite the powerhouse for hydration). Available at BeautyMART £12.00 each (which is pretty affordable as far as tailored treatment products go and considering they contain some brilliant beneficial botanical ingredients - damn that alliteration). I fell in love with Lixir Skin. 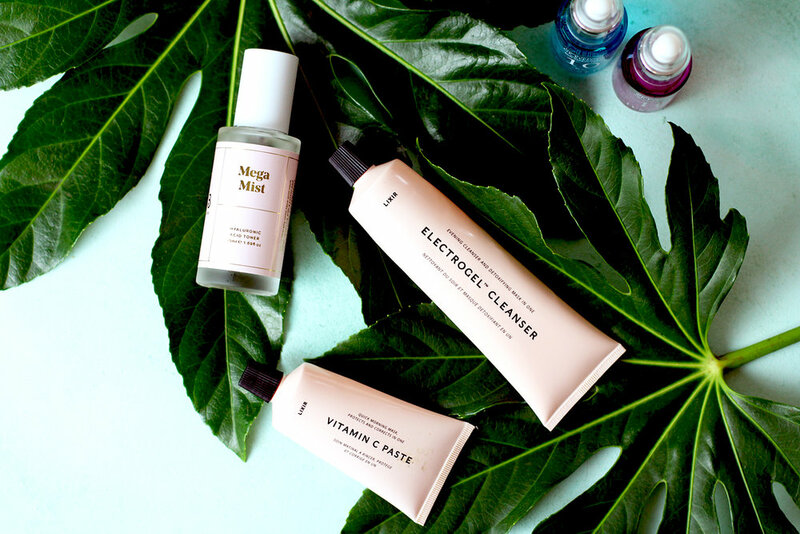 Minimal skincare, active ingredients and sleek packaging. The Electrogel Cleanser is a cooling, cream evening cleanse that's safe around the eyes for me. Definitely provides a deep clean but keeps skin hydrated and it smells of geranium; my winning scent. My favourite has to be the Vitamin C Paste though. I love massaging this on my skin with that comforting jasmine and mandarin scent sweeping through. I always wash this off knowing my skin is going to look fresh and glowing afterwards. (Vitamin C is another top skincare ingredient worth having in your routine). It has helped reduce the level of scarring I get in the aftermath of hormonal acne. It's been sad to see the wonderful Caudalie Activ range finish and leave my routine (especially the Detox Night Oil) but I've been trying out some newness in its place. BYBI's Mega Mist - a 100% natural hyaluronic acid mist which feel a bit like an essence on the skin. A host of lovely ingredients such as rose water, bitter orange water, algae extracts, lactic acid, aloe and lemon balm. Beautiful packaging but the spritzing mechanism isn't the easiest to use - mine has stopped working half way through. Using it out of the bottle with a cotton pad now. Lumene Skincare - This Finnish skincare range has given all kinds of awesome hydration for my skin. I adore the formulations of their creams (light but luxurious) and the Arctic Berry Cocktail Serum is a star product in my eyes. This brand deserves an entire blog post on its own. Watch this space. *It's Skin PR Samples // This post contains some affiliate links. A series of skincare favourites and how they have created this transitional skincare routine to meet a new season. Including zero-waste options. Exploring judgement free self-care rituals. Sometimes, it's all about relaxing with a good Vitamasque sheet mask and a cup of tea. A series of skincare favourites from breakout brands. From It's Skin to Lixir Skin and Nordic beauty brand Lumene. Embarking on a journey to take slow living lessons and apply them to beauty. Three things to focus on for a year of slow beauty. A review of Glossier, the new fragrance, You, and top recommended picks. Exploring the art of slow living through skincare. Featuring Caudalie.